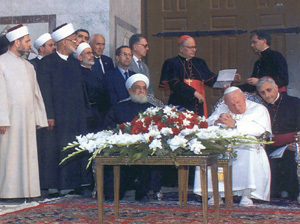 Who can judge the intentions of the Pontiff when he turned east and joined in prayer with the Istanbul mufti? This question of private intentions, in my opinion, is fundamentally wrong. We are not dealing with private intentions, everything about that visit was open, symbolic and quite clear in its main goal: Benedict intended to humiliate himself – and with him the Papacy – before the Muslim religion. This intention is quite unambiguous. First, he went to the mosque. Second, before entering it, he removed his shoes. Third, he humbly received “instruction” from Mustafa Cagriche on the basics of Muslim prayer. Fourth, he meekly followed the Muslim’s command to turn toward “the Kiblah” – the direction of Mecca. Then the prayer began. Fifth, he did not even make the Sign of the Cross or give any external sign that he was making a Catholic prayer. On the contrary, he imitated the mufti, crossing his hands on his stomach in a classical Muslim prayer attitude known as “the posture of tranquility.” Eyes closed, they prayed together for several minutes. Therefore, every external sign of a tacit apostasy from Catholic prayer was present, not any sublime personal attitude. This was the indisputable message Benedict XVI wanted to send to Muslims and Catholics. This was also how the world viewed it. The media heralded the “prayer of the Pope” in the mosque as an “unexampled gesture.” “Pope and Muslim cleric pray in historic mosque,” announced the London Guardian. “The Prayer in the mosque is the symbol of the Pope’s visit,” read El Mundo in Madrid. “The Pope turned toward Mecca and prayed like Muslims,” reported The New York Times. 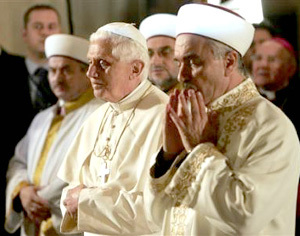 So, Benedict XVI became the second Pope in history (after John Paul II in Damascus in 2001) to set foot in a Muslim temple, and the first to pray publicly with a Muslim mufti. Once again, the matter in question is not the intention of the Pontiff’s prayer. It is the act itself, that symbolic act noted easily by the media, but glossed over by so many conciliar Catholics. Summarizing centuries of Church legislation, the Code of Canon Law of 1917 clearly stated: “It is not licit for the faithful to actively assist at or participate in ceremonies of non-Catholics” (canon 1258). Before Vatican II, for a Catholic layman - much less the Supreme Pontiff, to pray openly with pagans in a Muslim temple was simply unthinkable. Participating in heretical, schismatic or pagan worship was constantly and uniformly forbidden. Special permission had to be sought to attend weddings and funerals of non-Catholics. In such cases, a Catholic could only be passively present, and by no means participate in rites or ceremonies of false sects. To even enter a temple of false religion was a very serious matter. It was sinful if one had the intention to actually assist at a sacred function of pagans, or even if one appeared to be participating in the worship with pagans, thereby giving scandal. Also, a Catholic could not be a godparent of a schismatic or heretic. The Church has quite sound reasons for maintaining strong proscriptions against participating in the services of false religions or entering their temples. She has the duty to protect the faithful from religious indifferentism, an error that holds that eternal salvation can be found in all religions. “We reach now another cause for the evils that unhappily afflict the Church at this time. That is, we arrive at this ‘Indifferentism,’ or this perverse opinion that has spread everywhere as the work of evil ones, according to which it would be possible to achieve eternal salvation by means of any profession of faith, so long as the practices be upright and honest. It will not be difficult, in such a clear and evident matter, to reject from the bosom of the Catholics who are confided to your care this fatal error. It is almost impossible not to see that Benedict XVI incurred the condemnation above when he visited the Blue Mosque in Istanbul. Therefore, dear Jan, putting aside the question of private intentions, what we can see is that the Pope blatantly gave a great scandal to Catholics by his action. He implied that Muslims can be saved when they are good Muslims. Now then, this is precisely the error condemned by Pope Gregory XVI above. 1. Collectanea S. Congregationis de Propaganda Fidei seu Decreta Instructiones Rescripta pro Apostolicis Missionibus (Ex Typographia Plyglotta, Rome, 1907) vol 1, in Craig Allen, “The Holy Office on Worship with Non Catholics from 1622 to 1939”, Latin Mass Magazine, December 2006, pp. 22-26. 4. Gregory XVI, Encyclical Mirari vos, August 15, 1832, Recueil des allocutions, p. 163, in Atila S. Guimarães, Animus Delendi II, Los Angeles:TIA, 2002. Benedict preaching "communicatio in sacris"